Contractor Mike Holmes has a mission: Do home renovations right… the first time. 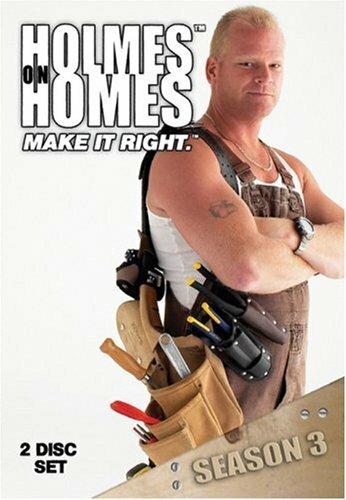 Holmes’ television hit, Holmes on Homes™, has helped over 50 million viewers around the world protect themselves against sloppy, dangerous and illegal renovations, as well as shoddy rip-off contractors who take the money and run. Since 2003, Holmes on Homes™ has aired all over the world, including on the Discovery Home channel and as of June 28, 2008, on TLC Saturdays at 2:00 p.m. and 9:00 p.m. and Sundays at 12:00 a.m. and 10:00 a.m. Holmes has also made several appearances on The Ellen DeGeneres Show and his book, Make It Right, became a HarperCollins #1 bestseller within weeks of its release. Holmes’ goal is to build homeowners’ visions. In Holmes on Homes™, people’s homes are transformed right before their very eyes… and yours. Now you can own the complete third season of this hugely popular TV series on DVD. Mike Holmes does not just renovate homes… he renovates lives. If you have any questions about this product by Bfs Entertainment, contact us by completing and submitting the form below. If you are looking for a specif part number, please include it with your message.